For the senator from Oregon, see Robert N. Stanfield. Robert Lorne Stanfield, PC QC FRCGS (April 11, 1914 – December 16, 2003) was the 17th Premier of Nova Scotia and leader of the federal Progressive Conservative Party of Canada. He was born into an affluent Nova Scotia clothing manufacturing and political family in 1914. He graduated from Dalhousie University and Harvard Law School in the 1930s. Stanfield became the leader of the Nova Scotia Progressive Conservative Party in 1948, and after a rebuilding period, led the party to government in 1956. As premier, he won three straight elections. His government was credited with modernizing the way the province delivered education and medical services. In 1967, he resigned as premier and became the leader of the federal Progressive Conservative Party. He was the leader of the Her Majesty's Loyal Opposition and fought three general elections, losing each time to the Liberals under Pierre Trudeau. He resigned as leader in 1976 and from public office in 1979. In retirement, he lived mostly in Ottawa, and died there in 2003 from complications due to pneumonia. He is sometimes referred to as "the best prime minister Canada never had". As one of Canada's most distinguished and respected statesmen, he was one of several people granted the style "The Right Honourable" who were not so entitled by virtue of an office held. Stanfield was born in Truro, Nova Scotia, the son of Sarah Emma (née Thomas) and entrepreneur Frank Stanfield. His family owned Stanfield's Limited, a large textile company. He studied economics and political science at Dalhousie University and was awarded the Governor General's Silver Medal for achieving the highest standing when he graduated in 1936 with a Bachelor of Arts degree. He then studied law at Harvard Law School, where he was an honours student near the top of his class. He was the first Canadian to ever edit the Harvard Law Review. During his student days in the 1930s, he witnessed the poverty that the Great Depression produced, causing him to become interested in John Maynard Keynes' economic theories. Stanfield considered himself a socialist at this time. Over time, he was less attached to socialism, but its influence on him remained, as he was considered a Red Tory for his appreciation of the common good. After playing a role managing Victory Bonds during the Second World War, Stanfield entered Nova Scotia politics. The Progressive Conservative Party of Nova Scotia was in poor shape. The Liberals dominated the province, and the Tories did not have a single seat in the legislature. In 1948, Stanfield was elected leader of the party, and began the long process to revive the party, culminating in a majority victory in 1956, their first in decades. Stanfield served as Premier of Nova Scotia, governing as a moderate. He led reforms in human rights, education, municipal government and health care and also created Industrial Estates Limited, a crown corporation that successfully attracted investment from world companies such as Michelin Tire. He won re-election four times. In 1967, the federal Progressive Conservative Party was racked by disunity between supporters and opponents of the leadership of John Diefenbaker. Stanfield entered the campaign for the party leadership. With the help of his Nova Scotian advisors and PC Party President Dalton Camp, he was the favourite and won on the fifth ballot of the 1967 leadership convention. Stanfield brought the Progressive Conservatives high in the polls, prompting many to expect him to defeat the Liberal government of the aging Lester B. Pearson. 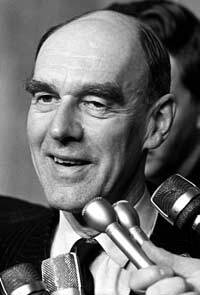 Pearson would soon retire, prompting the Liberals to choose a new leader, Pierre Trudeau. Trudeau was a charismatic public speaker, a strong performer on television, and provided the party with major credibility in Quebec. Stanfield's uniligualism and laconic speaking style contrasted poorly with the new Liberal leader. The Liberals were re-elected and increased their support to form a majority government in the 1968 election. While able to carry on as leader after his initial defeat, Stanfield faced a variety of problems within the federal PC caucus, most controversially his support of the Liberal Official Languages Act and official bilingualism, which threatened a caucus revolt led by Diefenbaker supporters. Stanfield's support of bilingualism did not endear him to the conservative base during his political career, though he earned much respect for his stand after he retired. In the election of 1972, Stanfield's Tories campaigned on the public's perception that the Liberals were mismanaging the economy. Though the Liberals started high in the polls, Trudeau's popularity had worn off and they slumped due to a poor campaign. The Tories came within two seats of defeating the Liberal government. The Liberals dropped to a minority government and stayed in power for two years with support from David Lewis and the New Democratic Party. The general election was expected to be close but Stanfield refused to sign the nomination papers of former Moncton mayor Leonard Jones; Jones had won the party nomination but he refused to support official bilingualism which was part of PC policy. In the federal election of 1974, Stanfield ran on a policy of wage and price controls to help inhibit the rapid inflation of the era. Trudeau mocked the idea, saying that one couldn't say, "Zap! You're frozen!" to the economy. Trudeau later wrote in his memoirs that Stanfield's platform allowed him to be sniped at from all directions. The Progressive Conservatives did well in the Atlantic provinces, and in the West, but Liberal support in Ontario and Quebec ensured a majority Liberal government, mostly at the expense of Lewis's NDP rather than Stanfield's Tories. Trudeau would implement the controls in 1975, drawing widespread criticism for the abrupt reversal. During the campaign, on May 30, 1974, a photo by photojournalist Doug Ball showing Stanfield fumbling a football thrown by Geoffrey Stevens at a stopover in North Bay, Ontario, became one of the defining images of his career. To this day, Canadian political commentators still point to this incident as one of Canada's foremost examples of "image politics", because the photo was chosen for the front pages of newspapers across Canada even though many other photos of Stanfield catching the same football were also available. Stanfield served as leader of the PCs and leader of the Loyal Opposition until 1976. He became renowned as a gentlemanly and civil man, but after three election defeats, he faced much criticism from inside the party, from members that felt he had continually failed to provide strong leadership against the Liberals. He resigned in 1976 and was succeeded by Joe Clark, who had a much more aggressive approach in his attacks on the Liberals. Stanfield retired from Parliament in the 1979 election which finally brought the Progressive Conservatives to power. After his retirement, Stanfield stayed out of politics until the constitutional debates, when he endorsed and campaigned for the Meech Lake Accord, the Charlottetown Accord, and free trade. He said that the Meech Lake Accord was a second chance to save Canada from disaster. "I'm not at all sure that I would want to live in a country that rejected Meech Lake," he said at the time. "It wouldn't be the Canada I grew up in. It wouldn't be the country with the values that I've loved during my life." Prime Minister Brian Mulroney wanted to appoint Stanfield as U.N. ambassador saying, "I tried to engage him further but he was leading a vigorous life and a very active life and he didn't want to change after a while." In 1996, Stanfield suffered a debilitating stroke that left him severely disabled. He died on December 16, 2003, in Ottawa, from pneumonia, only eight days after the Progressive Conservative Party merged with the Canadian Alliance to form the new Conservative Party of Canada. Fellow Nova Scotian — and final PC Party Leader — Peter MacKay suggested in an interview on CBC Newsworld's December 17, 2003 Morning Show that he had not personally spoken to Stanfield in regard to his opinions on the merger. It is unknown what Stanfield thought of the creation of the new Conservatives. His funeral service was held in Ottawa, and then he was buried in Camp Hill Cemetery, Halifax, Nova Scotia, next to his first wife Joyce Frazee, mother of his four children: Sarah, Max, Judith and Miriam, and with his second wife Mary Hall. Stanfield married Joyce Frazee in 1940, but she died in a car accident in 1954. During his term as premier, Stanfield remarried, exchanging vows with Mary Hall in 1957. Mary Stanfield died of cancer in 1977, and the following year, Stanfield married his third wife, Anne Austin. On July 1, 1992, as part of Canada's 125th anniversary celebrations, Mulroney appointed Stanfield to the Privy Council, along with 21 other non-politicians. This break with Canadian parliamentary tradition—inactive or non-politicians are not normally appointed to the Privy Council—allowed him to be called "The Right Honourable", even though he never was prime minister, the Chief Justice of Canada, or the governor general of Canada. In 2007, Halifax Robert L. Stanfield International Airport was named after him by Prime Minister Stephen Harper. He was a Fellow of the Royal Canadian Geographical Society, giving Him the Post Nominal Letters "FRCGS". ^ a b c Fraser (2003), p. A10. ^ Stevens (1973), p. 19. ^ Stevens (1973), p. 17. ^ Stevens (1973), pp. 30–33. ^ a b Laghi & Cox (2003), p. R7. ^ "Former Tory leader Robert Stanfield remembered as man of 'great warmth, humility'". CBC News. Canadian Broadcasting Corporation. Dec 17, 2003. Retrieved May 26, 2017. ^ a b Canadian Press (1992). Canadian Press (1992-07-02). "Hockey star, scientist among 22 appointees to Privy Council". The Globe and Mail. Toronto. p. A4. CBC Staff (2004-06-02). "An unforgettable fumble for Robert Stanfield". The National. Toronto: CBC News. Archived from the original on 2013-12-21. Retrieved 2013-12-21. Clippingdale, Richard (2008). Robert Stanfield's Canada: Perspectives of the Best Prime Minister We Never Had. Kingston, Ontario: McGill Queens University Press. ISBN 978-1-55339-218-7. Cox, Kevin (2003-12-18). "Nova Scotians proudly recall a political icon". The Globe and Mail. Toronto. p. A10. Fraser, Graham (2003-12-18). "The best PM Canada never had". The Toronto Star. p. A10. Hiscox, Heather (2003-12-17). "Death of Robert Stanfield". CBC News Morning. Toronto: CBC News. Laghi, Brian; Cox, Kevin (2003-12-18). "Robert Stanfield 1914–2003: 'Too good for public service'". The Globe and Mail. Toronto. p. R7. Lunman, Kim (2003-12-20). "Ottawa bids Stanfield goodbye". The Globe and Mail. Toronto. p. A9. Stevens, Geoffrey (1973). Stanfield. Toronto: McClelland & Stewart. The Party that Stanfield Rebuilt at the Wayback Machine (archived August 26, 2003) Article on Stanfield and the Nova Scotia Tories.